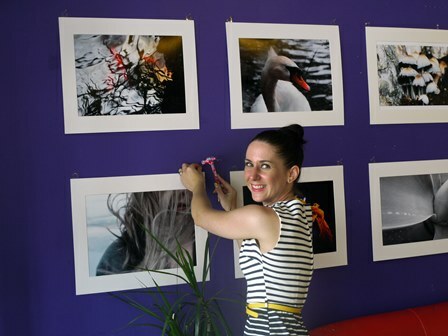 Left: Displaying the students’ prints at Jolt – Collegiate art teacher Catherine Richards. Right: One of the stunning images on display by Kotahi Paranihi, winner of Collegiate’s 2014 photographer of the year prize. Whanganui Collegiate art students are snapping their way to their Thousand Stars fundraising target for the Sarjeant Gallery redevelopment project. A selection of affordable A3 colour photographic prints of images taken by students in the last days of the 2014 school year will be on display till the end of March, including over the two Artists Open Studios weekends, at Jolt café in lower Victoria Avenue. Art teacher Catherine Richards says that at $25 each the prints are likely to be snapped up quickly and all proceeds will go towards the $1000 the school’s art department aims to raise as its commitment to the Sarjeant’s Thousand Stars campaign. Individuals, businesses and other organisations have been pledging regular donations totalling $1000 each to the Thousand Stars campaign, which has a target of raising $1 million towards the cost of earthquake strengthening and extending the 96 year old gallery in Queen’s Park. Catherine says the exercise aims to encourage the students to focus on the benefits of supporting charitable causes and taking part in fundraising. Since choosing fundraising for the Sarjeant redevelopment as its cause, Collegiate’s art department has already raised more than $500 from sales of students’ photographs over two previous exhibitions at Jolt and its $1000 target is firmly in sight. The prints provide a unique view of flora, fauna, people and places ranging from the railway yards and town centre to Castlecliff Beach and Virginia Lake. Catherine says the Year 9 students who produced the images were given a short lesson in basic composition before heading out to explore their assigned locations. About half had digital SLR cameras and the rest used compact models, and they had about 45 minutes to take their photos. They then spent about an hour making some basic adjustments with Photoshop. Catherine and Paul Collins, former Head of Learning in the school’s arts department, selected the prints to be shown at Jolt. They don’t carry the names of the photographers because Catherine says it’s not about individuals but about the collective fundraising effort. “I’m confident the prints we have selected will appeal to a wide range of buyers and of course we welcome donations over and above the purchase price as its definitely for a good cause,” says Catherine. Wanganui Collegiate’s music department is also a supporter of the Sarjeant redevelopment fundraising through a series of concerts featuring senior students. The school has also made the Prince Edward Auditorium available for several musical fundraisers.